After visiting the fuboTV website, we just noticed that they’ve launched their new streaming product in beta. 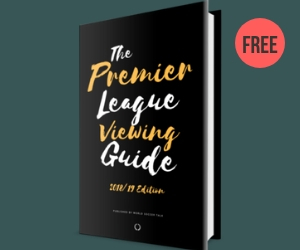 While the official announcement regarding the launch is expected soon, fans of Premier League clubs and world soccer can get a head start on all of the new channels and programming that are now available to soccer fans in the United States. The headline news is that fuboTV now offers channels from NBC Sports and FOX Sports which, combined with their previous staple of beIN SPORTS, Univision Deportes and a multitude of other channels, brings sports fans in the United States the most comprehensive selection of soccer channels and games. By subscribing to the re-launched fuboTV product (“fubo Premier”) for the introductory price of $34.99/month (discounted from the $49.99/month list price), the legal streaming service provides practically everything you need to go ahead and cut the cord on your cable or satellite TV service, thereby saving you literally hundreds of dollars (or more in many cases) a year. With the fuboTV product and an Internet connection, you can finally cut the cord and watch all the soccer you want as well as news, entertainment and movie channels. For Premier League fans specifically, here are the new channels that fuboTV has added to bring you the best of the EPL: NBC (in select cities), NBCSN, CNBC, USA, NBC Universo, Telemundo and (in the near future) NBC Sports App. So for a typical weekend of Premier League soccer, you’ll be able to watch all of the Premier League games that are televised across NBCSN, CNBC and USA. And, if you’re in a city where NBC owns their local affiliate, you can watch any EPL games that are on the NBC network. If you’re not one of those cities, you can purchase an indoor HD TV antenna for $10 as a workaround. At the same time, fuboTV now includes FS1, FS2, FOX Soccer Plus, FOX Sports Net, FOX (in select cities) and FOX Deportes. With those channels, you’ll be able to watch all of the UEFA Champions League matches on TV as well as World Cup 2018, World Cup 2022, World Cup 2026, MLS, Europa League, Bundesliga, FA Cup, and much more. The complete list of soccer channels as well as leagues and competitions that fuboTV now streams to sports fans in the United States is pretty exhaustive, which is why we’ve listed the details below for your reference. Signed up today as my cable company doesn’t offer beIN in my area. It seems a great value and offers a wide breadth PD channels. The one downside is, it doesn’t appear to be roku compatible, so I’m watching Bologna-Milan on my tablet. Hopefully it will become roku enabled soon! They have a Roku app so hopefully it’ll be updated soon. You might need to update your app. I have it on Roku. You can add YES to the MLS section since they show NYCFC’s games. Will you be able to watch the New York Yankees, since you have a deal in place with YES Network? 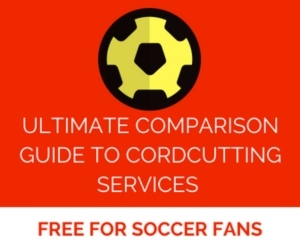 Or is your deal only encompassing soccer streams? It includes all programming from YES Network, so that includes the Yankees, etc. This is great news! As a current subscriber to DirecTV Now with the discounted rate, I had to do some heavy soul searching of switching packages, but I decided to go all in with Fubo. They have quality streams, DVR, and are a small grassroots company compared to DirecTV. Besides, the vast majority of channels I watch produce programming for soccer, and the Fubo App offers the best quantity and quality of footy despite having fewer number of channels. This seems incomplete. If the targeted audience is primarily soccer fans like their legacy service, then I can see the appeal up to a point. But the fact that the dvr is limited to 3 slots kills its usefulness. You can’t take advantage of the amount of soccer offered with only 3 slots. If the targeted audience is sports fans in general, the appeal is even less with no ESPN, TBS or TNT. So that means missing more than half the MLB playoffs, NBA playoffs and the entire NCAA basketball tournament. In regards to other sports, I guess their bet is on having a lot of RSN’s which is also rare for OTT platforms. In my case, I watch European soccer and NBA. The RSN coverage in my area is all I need so I’m happy. I bet you would complain if someone dropped a $1,000,000 in your lap too. is every channel closed captioned like Sling tv? fuboTV will be adding closed captioning to all of their channels in the future updates. When will they add the SAP function for beIN SPORTS en Español for those La Liga games that also have the English commentary on a separate audio stream? You can’t get that on BeIn Sports Connect either (has duplicate Spanish audio streams). fuboTV will be adding SAP function for beIN SPORTS soon. This looks very good. I’m going to hold out till they add NBC Sports Ap. That’s when I’ll pull the trigger. Let’s hope they do it soon. One thing to keep in mind is that it seems you will only be able to get the CSN and Fox regional sports networks that are available for your area. If you watch a lot of sports that is served by another regional network (e.g., ROOT Sports), you will need to at least keep the minimal cable subscription necessary to watch what is intended for your region. (Feel free to correct if I am wrong). Would be nice to have ROOT Sports online somehow. The blurb saying that PlayStation Vue doesn’t have regional FOX affiliates is wrong. I live in one of the areas that they have FOX available for on there (Minneapolis-St. Paul/Twin Cities), and I’ve got FOX on it. Also have the myNetworkTV affiliate in my area, my29, since these are both O&O networks here in the Twin Cities. Yes and no. the NBC Sports app is not yet supported. FS2G works with your Fubo account, but you can only get the channels around you. For instance, I get FS1, FS2, FSSoccer, FSMidwest (I actually get 2 feeds – Downstate Illinois and Indiana), FCollegeSports, and my local Fox Affiliate network games. There are components on both Vue and Fubo I want. Can I purchase both services simultaneously? Sure! But since the time that the above article was first written, Vue no longer offers beIN SPORTS, nor the EPL games that are not shown on television. Vue has already raised their prices and reduced the trial period from 7 days to 5 days. In order to receive FOX and NBC local channels I have to live in the city and not in the area of the network affiliate (ex. NBC affiliate WMAQ Chicago) to receive the channel on the my guide ? Hi Rod, good question. Your best bet is to sign up for one of the free trials and then you’ll be asked to enter your zip code. It’ll then determine which local channels you have access to. If you don’t get what you want, you can cancel before the end of the 7-day free trial.